New research released today by WWF and TRAFFIC reveal that China's elephant ivory trade ban has had significantly positive effects since coming into force on 31 December 2017, but still requires further action to influence key segments of society. Consumer research conducted in collaboration with GlobeScan, an independent consultancy, showed that respondents' claims of past purchase have reduced substantially and future intention to buy ivory products dropped by almost half to 26 per cent when compared to 2017 before the ban took effect. When prompted with information regarding the ivory trade ban, the corresponding percentage is 14 per cent. Support for the ivory ban also remains very high in 2018 with 9 out of 10 respondents saying they support it. All pre-ban legal ivory shops visited by TRAFFIC in 2018 have stopped selling ivory, and the magnitude of illegal ivory trade in most of surveyed cities and online platforms has decreased. The average number of new ivory advertisements in websites and social media platforms decreased by 26.6 per cent and 10.6 per cent, respectively, from pre-ban to post-ban. However the incidence of ivory purchase among regular outbound travellers stands out compared to the other buyers' segments. There are also other concerns with highlighted ivory trafficking hotspots particularly at the border with neighbouring Viet Nam, as well as a rise of activity since 2017 in China's ivory auction market, which remains the only legitimate post-ban commercial outlet for ivory sales. Another point of concern is the low level of respondents' spontaneous (unprompted) awareness of the ivory ban, which remains only 8 per cent since the ban although it has doubled from the period prior to the ban. TRAFFIC visited 157 markets in 23 cities and found 2,812 ivory products in 345 outlets in 2018. Compared to 2017, the number of stores with ivory decreased by 30 per cent. However, the number of ivory products found in three second-tier cities—Chengdu, Chongqing, and Hangzhou—and two third-tier cities—Dongxing and Pingxiang accounts for more than half of the total number in all 23 cities (56.0 per cent). "We are seeing some positive trends in post ivory ban China that indicate the new legislative changes may be yielding positive results. But persisting demand and a lack of awareness among consumers in some parts of the country as well as weak spots with insufficient regulation and enforcement means we need to redouble efforts in strengthening these areas," says Margaret Kinnaird, WWF Wildlife Practice Leader. 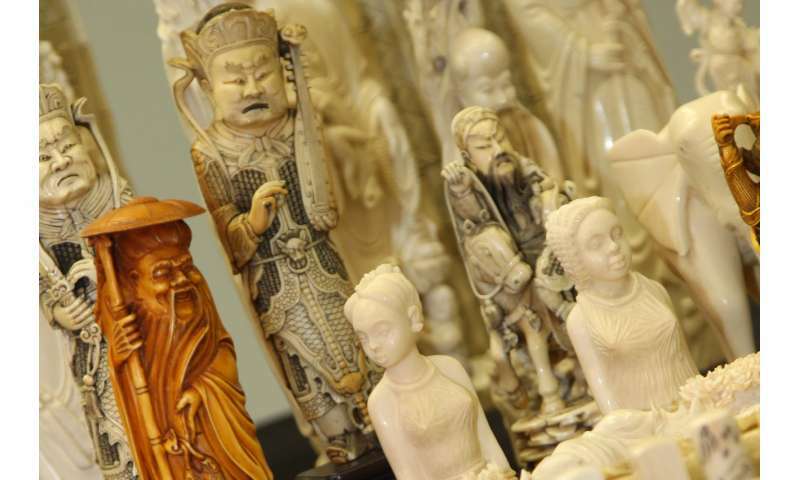 Despite these positive trends, further examination of the current exemption allowing antique ivory to be sold at auction revealed potential loopholes for laundering illegal ivory. Visits to 17 pre-auction exhibitions in Beijing, Shanghai, Suzhou and Nanjing in 2018 showed lack of compliance with the need to obtain administrative approvals from relevant authorities. Seven of them were in apparent violation of the laws and regulations related to elephant ivory auctions, resulting in 219 lots of elephant ivory items being withdrawn by law enforcement officers (with an estimated value between USD974,282 and USD1,082,536). During the survey, TRAFFIC also found some auctions mislabeled auction items in the catalogues in order to evade ivory trade supervision. "These three studies provide a critical tool for Chinese government efforts to further strengthen market supervision, law enforcement and public education for effective implementation to ensure the long-term success of the ivory trade ban." says Ling XU, overall coordinator of these research studies in China. "The closure of the legal ivory market has set a benchmark for other countries such as Viet Nam, where domestic ivory markets continue to drive elephant poaching and we hope that these studies will inform dialogues at key international fora such as the upcoming London Conference on Illegal Wildlife Trade and build a united global effort to achieve the goal of stamping out ivory trafficking for the benefit of elephant conservation."